There’s a new movement in the works. And it’s already bringing forth some powerful imagery. “Empire” breakout star Jussie Smollett and his sister Jurnee Smollett Bell, who’s gearing up to star in a new series “Underground,” have joined forces for the Creators of Color movement, just in time for Black History Month. The new platform will highlight diversity in the creative sphere through images, visuals essays and insightful interviews to tell our stories and to make our talents more visible. We’re SO here for black empowerment! In the compelling pictorial, Jussie and Jurnee are dressed in all black while raising their black-gloved fists in the black power salute. Their photo is the first installment of an ongoing portrait series shot for Creators of Color. The campaign will be highlighting artists both in front of and behind the camera who inspire us to push the limits of creativity everyday. We’re sure folks will have something to say about this, just as they did when Beyonce and her dancers held up the black power salute during her halftime performance at Super Bowl 50. If you haven't noticed, tons of think pieces both supporting and condemning Beyonce's performance have taken over the net since Sunday. We’re certainly here for empowerment and anything else that inspires our community to be great. 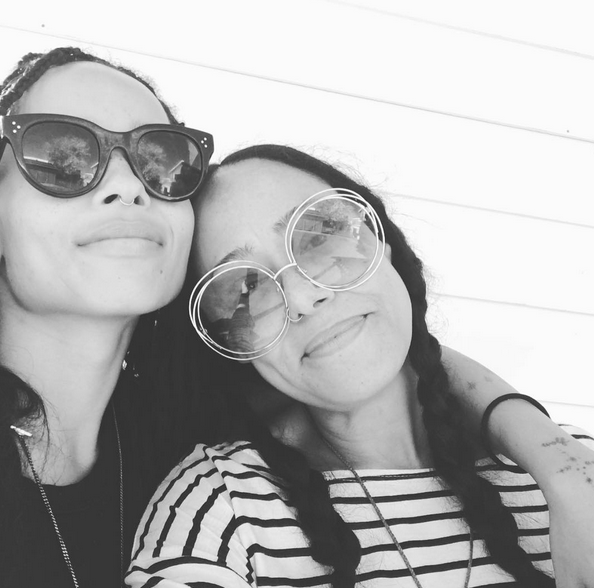 Divergent star Zoe Kravitz found time out of her busy schedule for a girls’ day out yesterday with her godmom, who happens to be actress & voice-over star Cree Summer. Zoe's mom Lisa Bonet and Cree have been great friends for years, ever since they starred together in "A Different World."